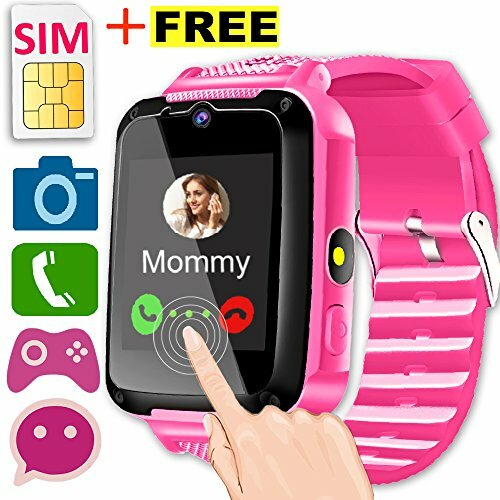 iGeeKid Kids smart watch -- Just for your lovely kids. > Size: Watch strap length: 230mm/9.4"
> Watch dial width: 40mm/1.57"
> Watch dial height: 14mm/0.55"
- We have already prepared a Speedtalk card for you in the package. After you activate the card, you can use the phone function. - When you insert a SIM card, the watch needs to be turned off. - Any problems,please feel free to contact us anytime. 2018 New Upgrade S6plus X Edition With FREE SIM Card: 2018 Brand new designed. Upgrade to HD Touch Screen, faster than our S6 models.Compatible with Speedtalk mobile,(★ Package contains a Speedtalk card ★) makes call easier.400 mAh High-capacity battery. Built-in Stopwatch, Math game, Night flashlight, Anti-lost, Camera, Clock, Supports multiple languages.Bring you a better functional experience. Super HD LCD Screen + New UI design + Food-Grade Strap: 1.54" high-definition color touch screen, display delicate, realistic, touch slide operation, convenient for baby use. The new UI design makes the presentation of the form more diverse.Food-grade strap, anti-allergic, anti-static, no fading, more soft and healthy, Give your child a baby-like skin care. HD Two Way Call+Game watch: Two-way high-definition call, communicate with your child is very simple, you can talk to your child anytime, anywhere to share the mood, caring about the situation, parent-child interaction everywhere.Built-in 2 exciting and fun games, the children can play through the touch screen and select the game for their prefer. (Copter and Frog Candy) Exercise the child's reaction skills.